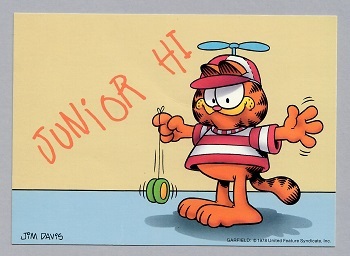 Garfield depicted as a yo-yo playing junior high school cat wearing a propellor beanie cap. Garfield is a comic created by Jim Davis. Published since June 19, 1978, it chronicles the life of the title character, the cat Garfield, the human Jon Arbuckle, and the dog Odie. As of 2013, it was syndicated in roughly 2,580 newspapers and journals, and held the Guinness World Record for being the world's most widely syndicated comic strip.